A Pathfinder Society Scenario designed for 4th-level pregenerated characters. 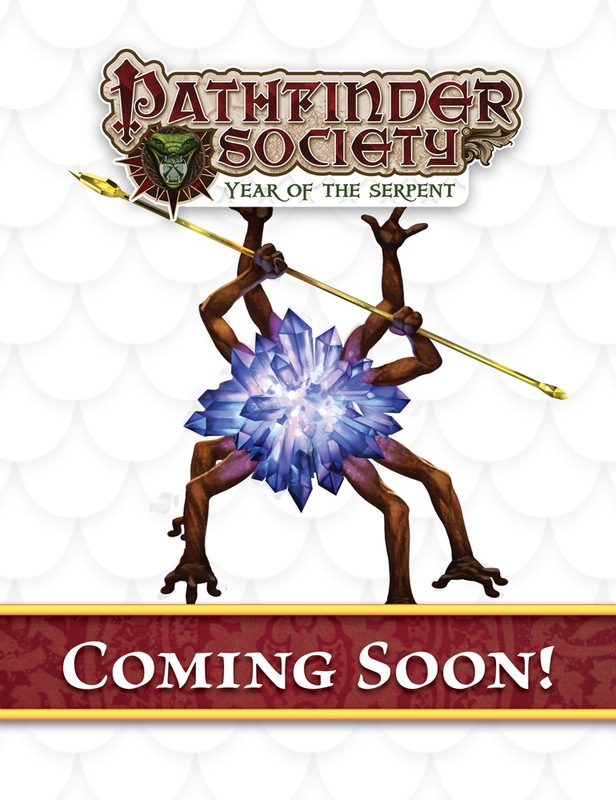 For several years, the Pathfinder Society has enjoyed a mutually beneficial alliance with the Sewer Dragons, the dominant tribe of kobolds living beneath Absalom. When an elite patrol discovers a wounded member of the Society with a desperate message, the Sewer Dragons must move quickly intercept an extraordinary threat from seizing their territory—if not Absalom itself! In this special adventure the players portray kobolds as unlikely defenders of the City at the Center of the World using 4th-level pregenerated characters. Note: True Dragons of Absalom is a limited release scenario. It may be run anywhere, but only by 5-star GMs. Venture-Officers may only run this scenario if they meet this star rating requirement. I enjoyed this scenario tremendously. There are some very entertaining NPCs (thanks in part to the thespian capabilities of our 5-star GM), and the pre-gens were written in such a way as to encourage player to role-play as kobolds. There was a uniquely kobold-ish mechanic for the 2nd encounter that, while time-consuming, fit the scenario perfectly and was a lot of fun for everyone at the table. I suspect that many tables only get to enjoy the first half of the scenario, and never even set foot on the other side of the portal, which is unfortunate. It took my group EIGHT HOURS over two sessions to complete this scenario. We loved every minute of it, but if you don't have that much time, I'd recommend another adventure. The kobolds are definitely fun to play. The scenario is packed, so make sure you have enough time for it. True Dragons is worth playing just for the large encounter in the middle section, but the rest of it is pretty good too. If you get a chance to try this one, I strongly recommend it. The only real caveat is that you need to keep an eye on the time a bit, because it is a scenario that can get away from you depending on how long the PCs decide to take on some things. Kobolds are Best! Better than the rest! Full of memorable characters, hilarious situations, and so very many traps. A blast to play, even better than the goblin scenarios. I loved the scenario, as well as everyone and everything in it. Plus, the boon alone would have gotten me to try to play this. Though that's mainly favouritism speaking. The problem is, there's so much fun, intriguing stuff in here that it's hard to fit it all in on time. Especially considering the nature of the pregens, you're basically encouraged to over-think everything. Add that to the fact that the special bit roughly halfway through the scenario can easily be over-thought, and players who can't co-ordinate can run out of time before even that part's over. Please tell me we'll be able to play this in time for Paizocon, because I'm so there. I believe this is debuting at Gencon. Confirmed. This debuts at Gen Con 2015. Hmmmm. Is this opening to door to kobolds as a playable race in Season 7? In discussions with the author, there are definitely some interesting (and likely substantial) kobold-related boons that might appear on this adventure's Chronicle sheet. At this time, though, that's all that I can say on the matter. Will we only be able to apply credit for this to a 4th level PC (assuming we can apply credit at all)? Or will there be a broader range? No, I have no plans to sanction kobolds as a playable race at this time. Will there be 6 (or more) pregens to go with this adventure? I am assuming yes as the current PFS table size assumption is 6 players. The plan is to have six pregenerated kobold PCs for this adventure. This is absolutely marvelous, a sequel of sorts for Sewer Dragons of Absalom, one of my all time favorites, and this is a Gen Con run, I remembered seeing it when I signed up! Yes! While I probably won't be playing a Kobold in regular society play for at least two more years, if not longer, at the very least I can play some pregens. This is awesome, I hope to see more Kobold adventures in the future. They have to catch up with the Goblins after all. So this is the 5 star special one? Correct. The Aspis one (6-98 Serpents Rise) is going to be the 4 star special. EDIT: This is after they debut at GenCon. Question about this, since I'm interested in the Aspis ones for non-Society reasons. No. We need to reward 4 and 5 star GMs with some things unique to their station. If I get my 5th star after this is released, will I get access to this or do I have to get my 5th star before it is released to qualify? I am so close, I am just wondering if I need to make sure I get my last two specials and last few normal sessions out before GenCon. Question: does this module fit into the timeline of 6-97 to 7-01, or is it independent? I have the chance to play 6-97, 6-98, 7-00, and 7-01 in order, but this module (6-99) will not be played until afterwards! Does that cause me to miss any inter-related story? Or is this module a standalone? 5 star only? What if we want to run this as a convention special? I'd like this to be our special at a local con. Dark_Angel, you are more than welcome to network with our current 5 star GMs and see if one or two can make the trip to your location. If you don't know who to ask, contact your nearest VO and they can put out the word. Is there another update due for this one? I do not see any maps in the scenario? 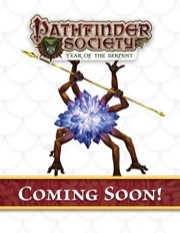 Dumagand, to answer your question here and in the Sky Key Solution thread, as your e-mail to your paizo.com e-mail address mentioned, you have the super-preview version sent out to Gencon GMs to give you max prep time. There will be a final version, just not yet. I'll check with my scenario-granting coworkers to see when we can expect this. Will the pregens be generally available, or will we have to wait until game time to see them? Is this playable as CORE? Other preg-only modules are (WBG series, for example). Why would this not be? Do you have any reason to think this this scenario would be different from all others? Because the Aspis one apparently isn't. It's fair to think that there are exceptions. The two exclusives at Gen Con (True Dragons and Serpents Rise) didn't have CORE tickets sold for them. Because we are currently between Campaign Coordinators, we have to wait until a new one is hired before we get the answer to whether we can run them for CORE or not. Currently it is not clear whether they will be legal for CORE or not so it's better to simply not run them CORE. Currently it is not clear whether they will be legal for CORE or not so it's better to simply not run them CORE. Something something something forgiveness, something something something permission. If it were different, they'd tell us. We have every reason to believe they work in core, because everything thus far has, and because the core rules say all the same scenarios, modules, and sanctioned adventures in standard are legal in core. Both campaign "modes" use the same scenarios, modules, and other sanctioned adventure resources. So, from what I've read of this discussion, this module will not be available for purchase to the masses? If that's the case, I'm highly bummed out. (well, sort of bummed out =P ) as I run PFS modules as a modified home game and this sounded interesting. It will probably EVENTUALLY be available to the masses, but will be exclusive to five-star GMs for at least a year, I would expect. It's unfortunate for us too because we only just got a 3-star last month. Maybe someday we can run this in our little burg. What you need to do Kevin is organize a game day and sweet talk Myron Pauls from Winnipeg into coming out and running both of the exclusives for whomever wants to play them. Bribing him might be good, putting him up in a nice hotel or something might go a long ways too. If you could talk Scott Young into coming with him, he could run Serpent's Rise while Myron runs True Dragons. Something to think about. Back when we only had one VO/5-star in Michigan, Doug Miles would go all over the state to run the exclusives for people. If you reach out to them, they just might be willing to help you out. I know I really enjoy running both of the exclusives and if someone offered me a place to stay and maybe a meal I'd be willing to drive a few hours to run them for a group.